The best advice I ever received was: “do what makes you happy." I heard this for years. Now, I understand what it means. 1980: Born to Bill and Sally Corbin, the greatest parents ever. 1985: Caught my first smallmouth bass—my first lesson in passion. 1986: Chopped down a tree with a hammer—my first lesson in persistence. 1987: Won a roller skating dance contest with a single dance move—my first lesson in marketing. 1990: Covered my entire room and body with Michael Jordan gear—my first lesson in brand experience. 1992: Returned a stolen walnut to the store manager—my first lesson in honesty. Thanks Mom. 1994: Totaled my parent’s minivan—my first lesson in experience. 1998: Set a school record for most losses as a starting quarterback—my second lesson in persistence. 1999: Graduated from Siloam Springs High School—headed west in pursuit of HAPPY. 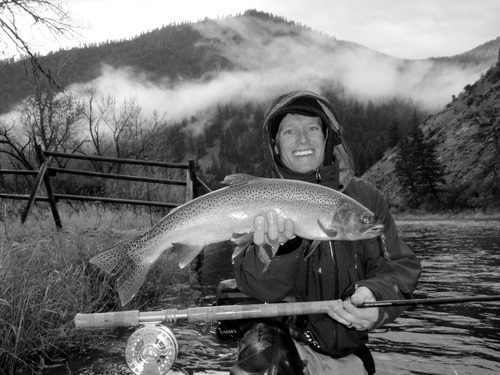 2003: Graduated from the University of Montana with a degree in Fly Fishing. “Do what makes you Happy"
2004: Marketed water rights at the Montana Water Trust—my first lesson in specialized knowledge. 2006: Married Linsey Corbin—my first lesson in love. 2007: Received an MBA—the beginning of my pursuit to continuously learn. 2008: Failed to launch White River Brewery, and sold the business plan to USC—my second lesson in entrepreneurship. 2009: Failed to launch Brew Solutions, Inc.,a plastic beer keg company—my third lesson in entrepreneurship. 2009: Founded Lotic LLC, a water rights marketing and management company—my on-going lesson in entrepreneurship. 2010: Founded CorbinBrands LLC—an umbrella company for all other ideas and marketing endeavors. My latest quest for happiness is to better understand the role of STORY in the world of digital media. This path feels better below my feet than any that have come before it. Because the fire in the belly continues to burn.